How to enjoy a visit from mainland Vancouver. Sometimes an escape is just needed. But with a province as beautiful as British Columbia, you really don’t need to go far. Vancouver Island is just a hop over from mainland B.C. but holds an abundance of beauty. In Greater Victoria, you will find a quaint, relaxing community called Sooke, which is home to our beautiful resort, the Prestige Oceanfront Resort. 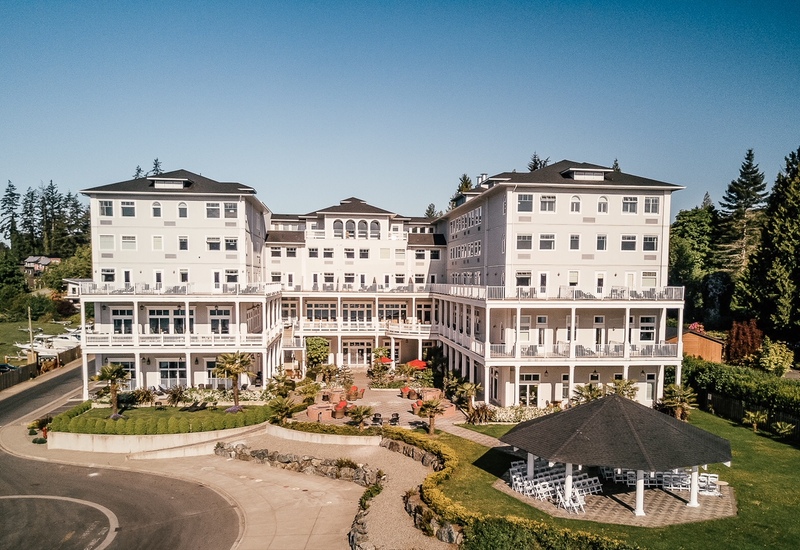 Rising above the Pacific Ocean, the resort offers breathtaking views of Sooke Harbour, Sooke Basin, the Strait of Juan de Fuca and the Olympic Mountains. Within our full-service resort, you’ll enjoy luxurious guestrooms, exceptional dining experiences, a world-class spa, and extraordinary hospitality. Conveniently located near unique local attractions, the resort is perfectly situated to inspire a truly West Coast experience. 5 ways to make the most of your time there. Whether it means having a sleep in and getting breakfast delivered to your waterfront balcony, star gazing by the fire pit in the courtyard, or searching for sea life at the pier, you can simply stay, and enjoy. Or maybe it’s making use of the indoor swimming pool and hot tub, enjoying an exclusive dining experience at our on-site restaurants, or using our complimentary bikes to explore the area. You may find it difficult to leave the relaxing atmosphere and amazing views of the resort, but if you need to, read on to learn about some of the other amazing activities to do nearby. The potholes are deep rock pools naturally carved into bedrock. You can either walk high above the canyon walls and stop at the overlooks or walk on the banks by the water. You only need a few hours to wander around, however, if the weather is nice, a picnic or a swim in the crystal clear water below is a popular option. It is most certainly a refreshing experience but one of our all-time favourites. The West Coast of Vancouver Island makes for a beautiful day out. Highway 14 runs along the coast with a collection of beautiful beaches and hikes all the way through to Port Renfrew. You could hike a section of the Juan de Fuca Trail from Botanical Beach to China Beach or just visit the beaches individually. Mystic Beach is another popular place to visit whereby the walk includes a suspension bridge, a swing rope on the beach and a lovely location to picnic by the ocean. Another popular spot to visit is the unique tree canopy of Avatar Grove. It is home to the rare Douglas Fir and the Giant Red Cedar trees. The walk is relatively easy for all family members and provides spectacular shade for those warm days out. The size of these trees is incredible and is a must see while traveling on the West Coast. Note: If you go, keep an eye out for “Canada’s Gnarliest Tree” — a whimsical knot of twisted cedar. A magical place to peace out and leave your real-world avatar behind. On the way home, don’t forget to stop in at some of the beaches as mentioned above to wash off the sweaty hiking day. With such a wide range of activities, from sight-seeing, scuba diving, hiking, cycling, fishing, kayaking, whale watching, zip lining and much more, Sooke is a scenic destination that you will find to be Greater Victoria’s best kept secret. An ideal haven for relaxation and rejuvenation, you can’t go wrong with an escape to the Prestige Oceanfront Resort. Check out our Prestige Adventurers experience in Sooke.